Businesses sought to sponsor young people's bid for fame. Businesses are being sought to sponsor an exciting new youth project in Peterborough to give young people their five minutes of 'Fame'. West End in the City, is being run by Peterborough City Council's youth service which is working with young people from all over the city on a production of the hit musical 'Fame'. 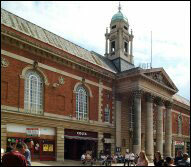 The show will be performed at The Cresset, Rightwell, Bretton, Peterborough on Friday 6 July 2007 at 7.30 pm. Workshops will be held next month to recruit the cast, musicians and back stage staff but organisers are also looking for local businesses and organisations to sponsor the project. Councillor Matthew Dalton, spokesman for young people said: "West End In The City is a fantastic project because it provides an opportunity for young people who have never performed before, or those with an interest in set or costumer design to play a part in this exciting musical production. "Youth workers are working closely with experienced dance and drama teachers, and other theatre professionals so it is an opportunity for young people try something new, learn new skills and have lots of fun." Caroline Dolby, curriculum specialist youth worker for Peterborough City Council's youth service, said: "We want the whole community to play a part in the production and businesses can get involved by helping us to make it happen. It could be advertising in the programme or sponsoring the tickets or flyers. The opportunities are endless. Please give us a call and find out more." In addition to the performance at The Cresset, there will also be a mini performance at Peterborough Festival and a version of the finished production will also tour youth clubs across Peterborough between September and December. To find out more about sponsorship opportunities contact Caroline Dolby on 01733 746048.